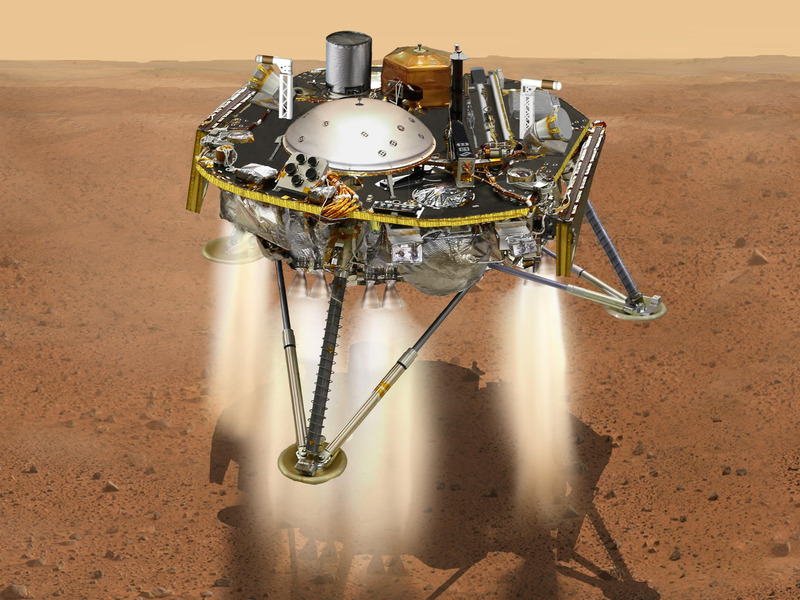 NASA/JPL-CaltechAn artist illustration of the InSight lander on Mars. NASA’s Insight lander, the first mission to Mars since 2012, is scheduled to land on the red planet Tuesday, November 27. Once there, the lander will study Mars’ temperature and check for marsquakes. The landing is expected to be difficult because of the planet’s thin atmosphere and potential dust storms. NASA’sInSight lander, the first mission to study the deep interior of Mars, is scheduled to complete its six-month trip to the red planet on Tuesday morning. 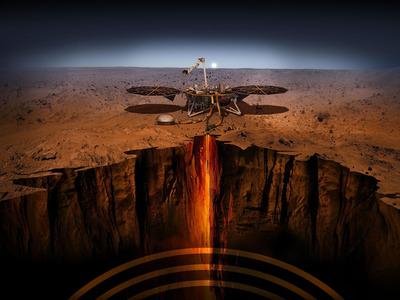 InSight, the first spacecraft NASA has sent to Mars since the Curiosity rover landed there in 2012, will drill about 16 feet down to check the red planet’s temperature and insert a seismometer into Martian soil to study marsquakes. But before it can do any of that, the spacecraft has to land. It won’t be easy – the atmosphere on Mars is very thin compared to Earth’s, so it does not produce enough friction for a spacecraft to slow down to a safe landing speed. Only 40% of missions to Mars have survived the landing; the United States is the only country to have successfully landed anything on the red planet. According to NASA, the InSight lander will enter the Martian atmosphere going about 19,795kmph. It will only have about 6.5 minutes to slow down to about 8kmph, which it will do by using a parachute and firing descent thrusters. If everything goes according to plan, the spacecraft is expected to land on a flat, stable surface at Elysium Planitia – a broad Martian plain with few rocks or boulders – at about 7am AEDT Tuesday. InSight’s design, including its heat shield and parachute,are very similar to that of NASA’s Phoenix spacecraft, which successfully landed near Mars’ north pole in 2008. However, InSight will have more mass when it enters the Martian atmosphere than Phoenix did, which makes the landing more challenging. The new spacecraft is also expected to touch down at a higher elevation than Phoenix did, which means it will have less atmosphere to rely on for slowing down. The InSight mission is led by NASA’s Jet Propulsion Laboratory in Pasadena, California. InSight, which set off from California’s Vandenberg Air Force Base in May, was the first interplanetary rocket that NASA has launched from the West Coast. The lander left Earth accompanied by two small Mars-bound satellites that are collectively called Mars Cube One. Once set up, InSight will stretch 6 metres long and weigh about 360kgs. It will be powered by two 2-metre-wide solar arrays. To measure marsquakes (which are similar to earthquakes but, of course, not on Earth), the lander has antennas that can record how much the planet shakes and wobbles. This data could help scientists determine whether Mars’ core is solid or liquid. NASA/JPL-CaltechAn illustration of NASA’s InSight Mars probe about to land on the Martian surface. The lander is supposed to collect data on Mars until at least November 2020. NASA hopes to use this information to draw new comparisons between the interiors of Earth and the red planet. Eventually, the research could be used to learn more about which types of Earth-like exoplanets could support life. On Monday, NASA will be relying on other spacecraft and radio telescopes on Earth to monitor InSight’s radio signals and determine when it reaches the red planet. The lander’s design should allow it to touch down safely on Monday even if it reaches Elysium Planitia during a dust storm, thanks to the thick heat shield that protects InSight from dust. Although the entire landing won’t be captured on video, NASA will broadcast live commentary and updates, along with photos showing InSight’s descent.